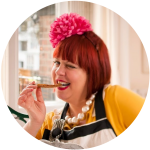 When I started my supper club back in 2009, sparking a movement of home restaurants and pop-ups around the UK, I had to make some sacrifices. I gave up my living room, my TV and my comfy sofas to turn it into a ‘restaurant’. Now I have 3 long tables down the centre, a side board with cutlery and glasses, the general paraphenalia of a restaurant. In the middle, a marble chimney place with a log fire adds a humming warmth to wintery events. But this chef needs a comfortable seat at the end of a 16 hour day. I ordered a purple ‘Wilfred’ sofa from Out and Out Original. which has a high back that is ideal for sitting in front of the log fire, keeping out the draughts. The winged shape of the back alludes to the Edwardian era, when my flat was built. I like a blend of vintage and vibrantly new, so this shade of lavender is just the ticket. In baking I like to use floral flavours. 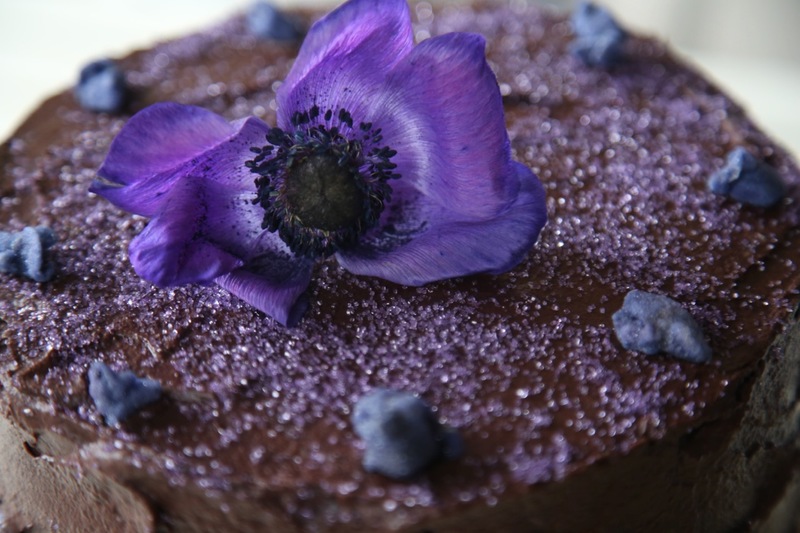 This recipe combines violet, in the form of crystallised petals, sugar and sugared balls. It’s quite an adult cake in that I’m using dark chocolate, but use milk chocolate if you would like a sweeter confection. Preheat the oven to 160C. Grease and line the cake sandwich tins. Combine the butter, sugar and vanilla in a stand mixer until fluffy. Gradually add the 6 eggs one at a time, beating in between each addition. Melt the chocolate in a microwave (only 30 seconds at a time, we don’t want the chocolate to seize) or in a bowl over a pan of hot water (the bain marie method). Add the melted chocolate and continue to beat. Pour in half the flour, combining lightly. Add the rest of the flour. Divide between the 2 tins, around 700g each. Bake for 45 minutes. Use a thin layer of the buttercream to spread a ‘crumb coat’ over the rest of the cake, doing the sides first so you can spin it around by holding the top. Add the ‘crumb coat’ to the top. A crumb coat is a very thin layer of icing or buttercream that allows the second coat to adhere. Finally, using the palette knife, spread the ganache over the sides and top of the cake. 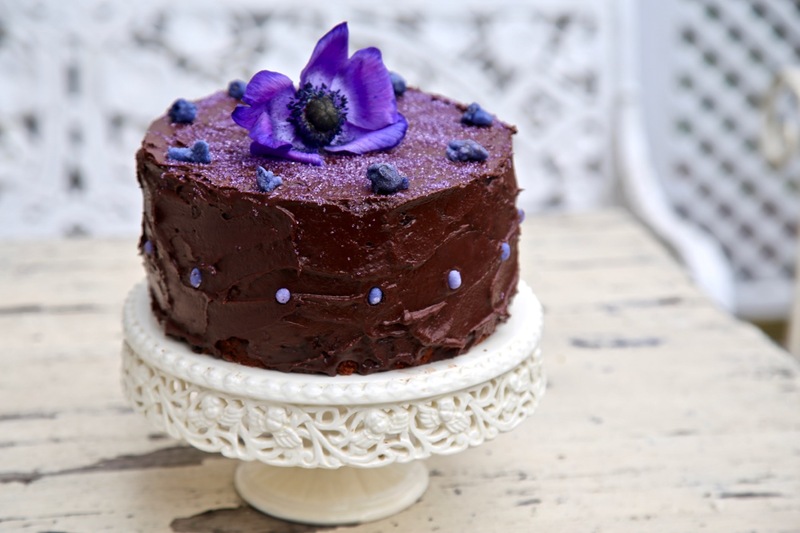 Leave the ganache to dry for a few minutes, then scatter the violet sugar over the top of the cake. 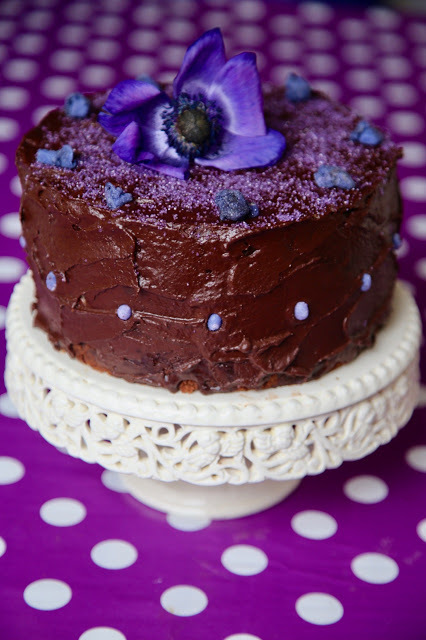 Add the crystallised violets around the cake. Stud the sides with the violet pearls.